Bonnie from a wee Meenit emailed us a week or so ago and showed us her adorable wreath that she made. She used Brooke's Burlap Wreath as her inspiration. 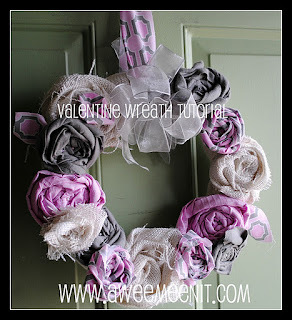 I absolutely love the colors and the way that her Valentine Wreath turned out! She has a really great blog and I enjoyed reading her post on Calling all Curly Girls. She is a Certified Curly Hair Specialist. She gave some really great tips on taking care of those curls. I am going to try a few of them out! All of us sisters have wavy to curly hair and could definitely learn from Bonnie! thanks for the feature, glad you liked it! !